Are TN drug compounders affected by new regulations? 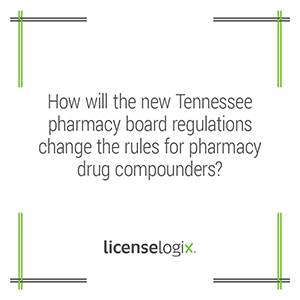 The Tennessee Pharmacy Board recently approved new regulations for compounding pharmacies in response to the fungal meningitis outbreak involving New England Compounding Center which sickened 745 people with 58 deaths. Require special registration for every pharmacy that performs sterile compounding. These new regulations will take effect when the legal notices are published, possibly in July 2013. In addition to these regulations, more actions are being considered. In fact, the board obtained additional staff including three pharmacists and one administrative person to enforce the new regulations. Keeping up with pharmacy licensing rules and regulations is challenging, especially if your business operates in multiple states. To gain comfort about your business licenses in an ever-changing industry, let the experts help. We can help you obtain all the licenses and registrations you need, as well as help with business license research. For additional help you can click contact us, or give us a call at (800) 292-0909.